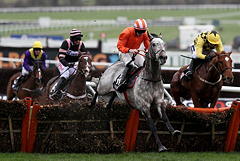 Labaik was a surprise winner of the opening race of The Festival at 25/1. The Gordon Elliott-trained six-year-old has refused to race four times in the past 12 months, and nearly did so on his previous start at Naas in February, trailing the field for the entire race. But today Labaik swept through to beat 3/1 joint-favourite Melon into second place by two and a quarter lengths, with River Wylde a further eight lengths back in third. He was ridden by 17-year-old Jack Kennedy, for whom it was a first Festival winner. A delighted Elliott said: "Jack gave him a great ride. Keith Donoghue was supposed to ride this horse and has done a lot of work with him, so a lot of thanks go to him. He's hunted him a lot. This should have been Keith's day. "We never made a secret about how good we thought the horse was. But I was wanting to go to Naas on Sunday, rather than here and face the embarrassment of not jumping off! I'm glad the owners were keen enough to come here. "He's got an engine. We haven't a horse to work with him in the yard; he's a machine of a horse. Where we will go from here I don't know. If he never jumps off again, it doesn't matter!" Asked why he thinks Labaik deigned to start today, Elliott replied: "You can use a long whip here [to crack behind the horses at the start] whereas you can't in Ireland, and I think he heard the crack of it and just went." Labaik provided young Irish rider Jack Kennedy with his first success at the Festival. The six-year-old grey was settled towards the rear of the field by Kennedy early on in the two-mile contest but made stealthy progress approaching the home turn to tackle the leaders. The son of Montmartre took the lead approaching the final flight and kept on gamely up the hill to score by a decisive two and a quarter-lengths. 3/1 joint-favourite Melon, trained by Willie Mullins, was second, with Nicky Henderson's River Wylde (8/1) a further eight lengths back in third. 17-year-old Kennedy has enjoyed a meteoric rise in the saddle and gained his first Grade One success aboard Outlander in the Lexus Chase at Leopardstown over Christmas. 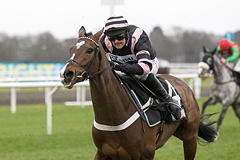 However, the jockey was elated to register his first victory at the Festival, commenting: " It is absolutely amazing. Words cannot describe what it is like [first Cheltenham winner]. There are too many people to thank. I have dreamt about this day for as long as I can remember. Today was the main day and it was great that it came right today." A quirky horse, Labaik has refused to race in four races in the last 12 months. However, Kennedy was always happy with the imposing grey in today's contest. He continued: "I would just like to thank the owners for keeping faith in me when Labaik didn't jump off at Naas the last day, and for keeping faith in the horse. "It all went brilliant. He was grand, just walking out onto the track he half had a think about things but I gave him a kick in the belly and everything was straightforward from there. "He jumped and travelled great and it couldn't have gone any better. I was probably a little bit far back but we went a good gallop. Labaik travelled away, although he jumped a little bit careful. 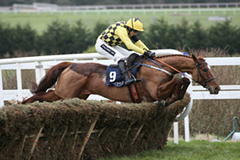 "I had one or two behind me early on but he jumped brilliant throughout. He travelled into the race well and I got a clear run. He got to the last and pricked his ears but to be fair he dug deep up the hill - he is a fair horse. "I can't believe it - it's just a dream come true. I'll be going home a very happy lad now at the end of the week." Trainer Nicky Henderson may have felt a sense of sinking as River Wylde threatened then folded, but being placed brought its own comfort. River Wylde, an 8/1 shot who eventually finished third, loomed like a winner on the home turn, but from that point he could not go the pace of runner-up Melon, nor the fast-finishing Labaik, who swooped to win by two and a quarter lengths and eight lengths. Melon, who was sent off the 3/1 joint-favourite with fourth-placed Ballyandy, was a first arrow at the meeting for Willie Mullins and jockey Ruby Walsh. Henderson, who won the race 12 months ago with Altior, said in the winners' enclosure: "He's run a super race, and if you think of all the horses we've had that have stood here [in the spot for placed horses] after the Supreme down the years, it's not such a bad place to be. They include Buveur D'Air last year, Sprinter Sacre a few years before that - it's quite a good place to launch your career. "I know Altior won it last year, but we've had a lot of good placed horses in the race. I don't mind - anything that stands here is okay." Of River Wylde he said: "He doesn't have to go chasing next season, but we'll see."